Who wouldn’t want to skydive over Victoria Falls, the largest waterfall in the world? Prior to the jump, the aircraft flies over the waterfall, giving you a breath taking bird’s eye view of Devils Cataract, Main Falls, Rainbow Falls, and Horseshoe Falls. It then circles back to the drop zone in the National Park, where you will step into masses of open African air. Most of their tandem skydives include a close up aerial view of the Mighty Zambezi River and the Victoria Falls. You can choose to jump from heights of 3500 ft, 6000 ft, 8000 ft and 10000 ft. This is one of the best places to enjoy a scenic view and experience the thrill of skydiving at the same time! Lauterbrunnen is a village in the canton of Bern in Switzerland. The helicopter ride to the diving point allows a beautiful view of waterfalls, glacial lakes, and lush green fields surrounded by the snow-capped mountains of the Swiss Alps. Upon reaching an altitude of 14,000 ft, you will get to freefall at around 200 km/hr. If that doesn’t give you a rush, I don’t know what will! This skydiving zone is one of the most popular ones. 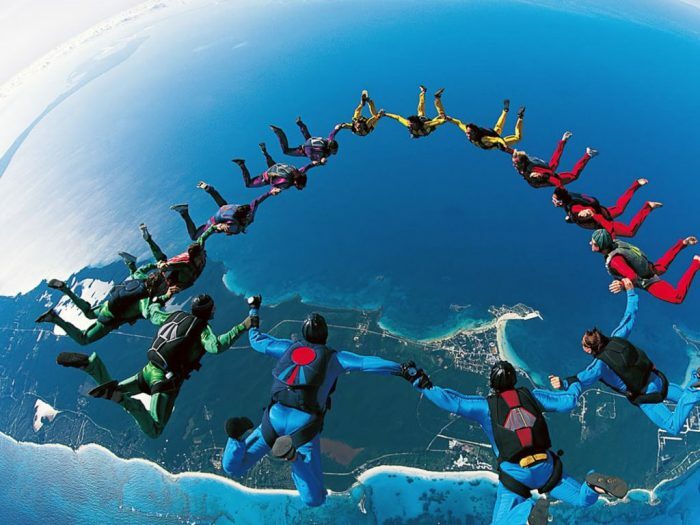 In fact, it is so popular that Skydive Dubai advises you to book your dive one or two months in advance! A thrilling freefall from 13,000 ft at over 190 km/hr, a tandem skydiving experience over the beautiful desert dunes or the iconic Palm Jumeirah Island is a must-try when in Dubai! This drop zone is probably the most diversely scenic one. It is located about 40 km away from Barcelona, between the Mediterranean Sea and the Pyrenees Mountain range, giving you two beautiful views to admire during the ascent to the drop point of 13,000 ft. After the initial freefall, you will have a five minute descent to the ground, during which you can you can enjoy the striking views of Cap de Creus and the Gulf of Roses. Looking to skydive from higher altitudes? Well this is your place! Jumping out of an airplane from an altitude of 23,000 ft is certainly on the bucket list of a lot of adrenaline junkies. CNN News Channel has ranked it 8th out of 50 adventure events in the world that you must ‘try before you die’. Pair that with the incredible view of Mount Everest and her sister peaks, and it becomes the perfect package of thrill and terrain.